We can totally do that... um, yeah. This just might be the best thing to happen to Metro in years. It's not every day you find escalators that work -- much less those same escalators spitting out breakdancers contorting themselves so they can hitch a ride on the handrails. And true, most people just read the paper or listen to their iPods while riding on the Metro. Boooring! But Charlie Michael, also known as Mad Sole, is not most people. Instead, he and a pack of friends grooved, strutted and twirled to make the positively intoxicating Metro Status video, seen below. 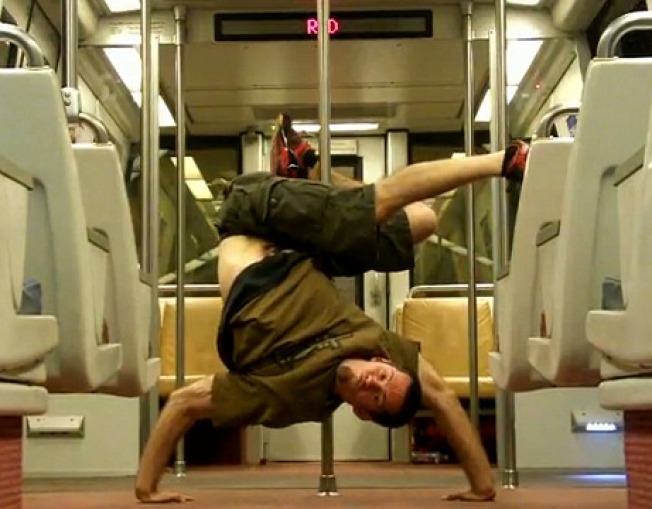 The video's dedicated to "the train system that gets us around every day." Um, sure. That's optimistic! But even the featured song cheerfully remixes sounds commonly heard on Metro, in particular the "doors closing" message. You know, right before the doors slam closed on your neck. Sure, we don't recommend breakdancing on station platforms -- hey, it looks kinda dangerous -- but the rest of it looks like it's a much better way to spend a commute than jostling for space on orange vinyl seats.